Picture taken at the Viola Cemetary. The following was in the January 31, 1990 edition of the Idahonian. Funeral services will be held Friday at 10 a.m. at the Moscow Nazarene Church for Dennis H. Music, 42, of Viola. Music died early Monday morning on Highway 8 east of Troy from injuries received in a logging truck accident. 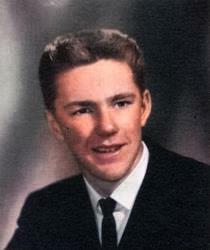 A family friend, Eddie Gray, will officiate at the funeral and burial will follow at the Viola Cemetery. He was born Aug. 14, 1947, at Moscow to Howard and Eloise (Greg) Musick. The family lived in Viola and he attended Moscow Schools, graduating from Moscow High School in 1965, He attended Spokane Community College, graduating from the mechanics program there. He returned to the Moscow area, where he worked variously for Widman's Caterpillar, Allis Chalmers Tractor and Hulton Honda, before becoming self-employed as a hauler and self-loader five years ago. 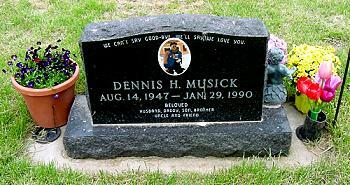 At the time of his death he was owner of Denny Musick Trucking. He and his wive Diana own the Plush Brush beauty shop in Moscow. He enjoyed motorcycles, tractor pulls, fishing and skiing, and was active in the Viola Water and Sewer System Committee since its founding. On Dec 9, 1978, he married Diana George at Moscow. She and his daughter, Heather, survive at their Viola home. Other survivors include his parents, Howard and Elouise Musick of Viola; two sisters, Penny Carscallen and Debbie Musick, both of Viola, four nephews, Buck Taggart and Bryan Thompson of Viola, Toby Carscallen of Great Lakes, Ill., and Dan Carscallen of Moscow; his grandmothers, Lyla Gregg of Viola and Mary Musick of Moscow; and several uncles, brothers-in-la and sisters-in-law. The family suggests that any memorial gifts be sent to the Potlatch Ambulance Fund. Services are under the direction of Short's Funeral Chapel.